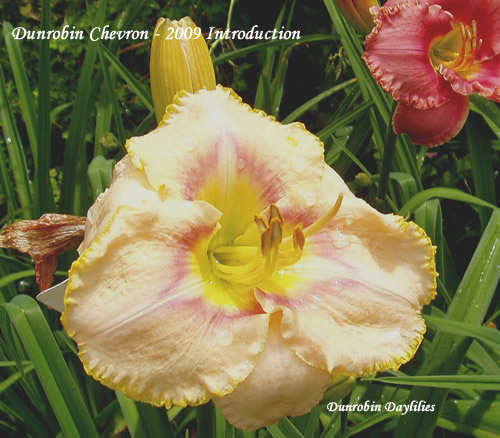 Dunrobin Daylilies specializes in hybrid daylilies of our own breeding that are hardy, healthy and beautiful. 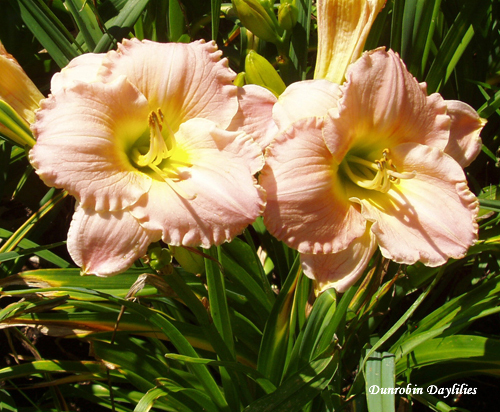 This year we are introducing two daylilies that are perfect examples of our goal. As well, we have included a gallery of possible future introductions. 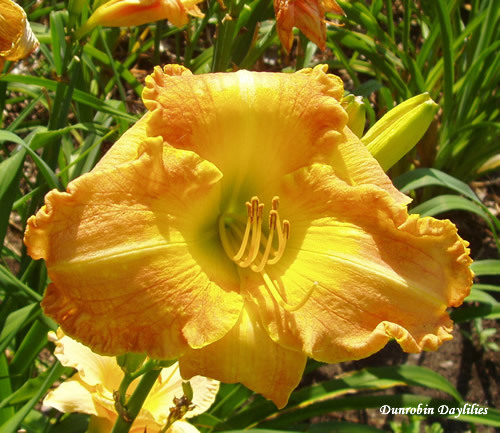 All plants are registered with the American Hemerocallis Society, the international daylily registration agency. Introductions - Click on the photo for a larger view. When I see DUNROBIN SHERBET in bloom each year, it is a real thrill for me. It is a great healthy plant with a lush opulent flower. 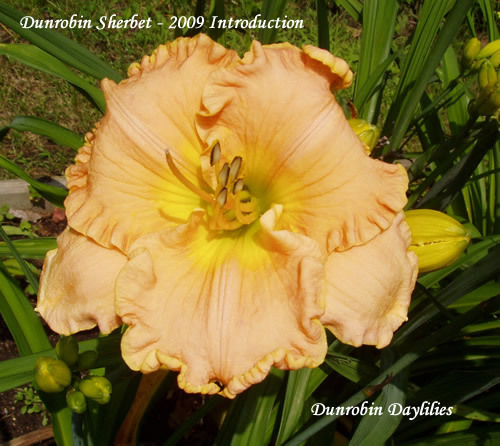 DUNROBIN SHERBET is a pastel creamy melon flower with a green throat, a diamond dusted surface and huge ruffles. It has many 6” flowers on a 3 branched scape. Dormant. Fertile. Tetraploid. From the first time I saw DUNROBIN CHEVRON, I hoped it would be a keeper. Fortunately it has excelled both as a plant and a flower. This year it is ready to introduce and I am proud to do so. DUNROBIN CHEVRON is a pale lemon crepe surfaced flower with a red chevron pattern around a green throat with a gold edge. It has 4 way branching and many 5” flowers on a 28” scape. Fertile. Dormant. Tetraploid. DELIGHT is a shrimp pink 6” usually double flower in the mid season on a strongly growing healthy plant. Occasionally it is a very large single flower. It can also be quite stippled. In any case, it is very lovely. A slight gold edge and a green throat give it elegance. With a ruffled edge and smooth glittering rolled back petals, Delight is a real beauty. This dormant plant with a 24” scape and a 20 bud count is fertile both ways. 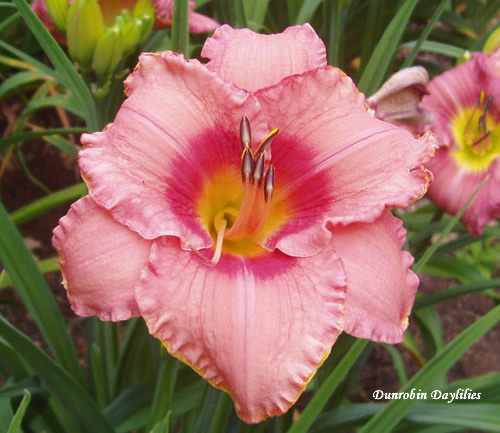 A showy plant, Delight is a wonderful flower for any border planting. Tetraploid. PINK PRELUDE is a mid to late mid season bloomer with a very heavy substance that opens well. A 6” very ruffled clear pink flower with a slight gold edge, Pink Prelude has a bright diamond dusted flower with a green throat and a strong corduroy surface. It has large ruffled edges and excellent substance. A fertile tetraploid, Pink Prelude has a 27” scape and a 20 bud count. Dormant. BELLE has beautiful clear rose pink 5 ½” flowers in the early mid season on a strongly growing healthy plant. A darker red eye, a slight gold/red edge and a strong green throat give it distinction. With a ruffled edge and smooth glittering petals, Belle is a real beauty. This semi evergreen plant with a 24” scape and a 22 bud count is fertile both ways. A true pink, Belle is a great flower for any border planting. Tetraploid. BUTTERSCOTCH is a mid to late mid season bloomer and what a bloomer it is. 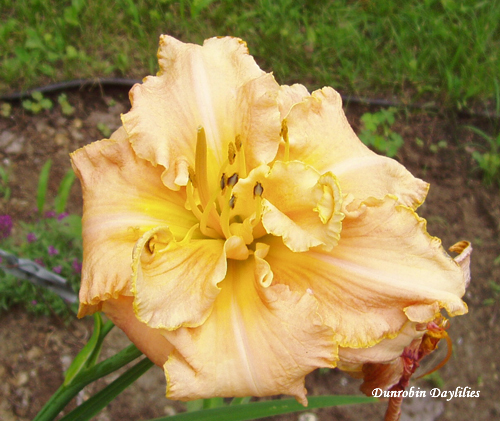 A very large flower – almost 7”, Butterscotch is a complicated flower to describe. It is a bright diamond dusted flower with a green throat turning to a clear buttercup turning to an ochre brushing – all very clearly defined. It has large ruffled edges and very good substance. A fertile tetraploid, Butterscotch has a 26” scape and a 23 bud count. Butterscotch is a beautiful flower commanding attention wherever it is planted. Dormant. Please note that all pictures are as the camera takes them - no alterations or adjustments of any kind. We welcome your comments on our introductions and our futures.